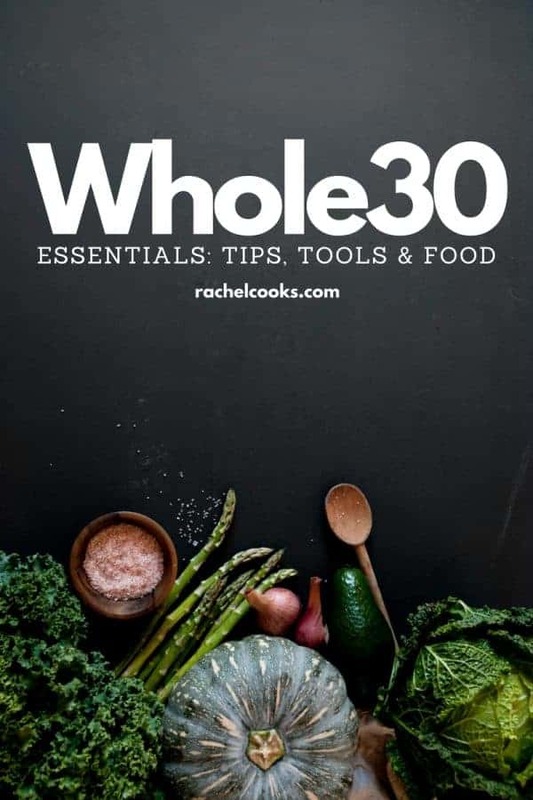 Whether you’re embarking on your first Whole30 or your 30th Whole30, this guide of Whole30 Essentials will make your life just a little bit easier! Well, I made it. 30 days without cheating once. I’m a little proud of myself, to be honest! I maintain a fairly healthy diet 80% of the time, but this was a fun (and very difficult) experience. Okay, more difficult than fun, but I’m the type of person that likes to challenge myself, and this was definitely a challenge. Thanks to everyone that held me accountable on Instagram, I had fun sharing the experience with you! First things first, what the heck is Whole30? I got that question a lot during the last 30 days. You can learn everything you’d like on the official website, but basically, it’s 30 days without added sugar, sweeteners (natural and artificial), grains (gluten and non-gluten), legumes (peanuts and soy included), dairy, gluten, and alcohol. It’s a lot of vegetables, eggs, meat, and avocados. You can also eat fruit and nuts (except peanuts), and sweet potatoes and regular potatoes. I ate a lot of sweet potatoes because with my workout schedule, I need at least some carbs throughout the day. In this post, I’m covering some Whole30 Essentials that really helped me have success with this program. I’ll start with tips, then talk about some kitchen tools and food that helped me get through the 30 days. At the end of the post, I’ll discuss what changes I experience and if I’d do it again. Worth noting: I was NOT paid to promote any of these Whole30 Essentials and was NOT sent anything for free…this is all stuff that I purchased myself. Well, with exception of the book that my friend was kind enough to loan me. Prep, prep, PREP. I didn’t go as far to portion out meals for the week, but I did try to get ahead on meal prep and have somewhat of a plan of what I was going to eat. 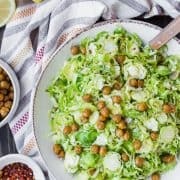 I always had greens in the fridge as well as a tasty Whole30 compliant salad dressing (I love this basil vinaigrette – I used it on salads, vegetable hash, chicken, salmon, and zucchini noodles!). Also in the fridge were always boiled eggs, chopped sweet potatoes (I kept them submerged in water to keep them fresh), guacamole in case my avocados failed me, and usually some roasted vegetables too. Often I’d cook shredded salsa chicken and have that ready and waiting in the fridge too. I loved roasting vegetables ahead of time, too – I almost always had some roasted broccoli in the fridge. Another great thing to prep is spaghetti squash. Make sure to check out this post to learn how to cook spaghetti squash – I cover five methods! Don’t do it over a holiday or a vacation. JUST DON’T. Life is too short. My Whole30 took place when I had two birthday parties to attend (one that I threw for my daughter), but I was able to stick with it through that. However, I would not have scheduled it if MY birthday was happening during the 30 days. It’s not really 30 days, it’s actually 42. The program recommends a reintroduction (you can read about that here if you’re interested). Basically you reintroduce 1 food group at a time, and then go back to Whole30 foods for two days after each food reintroduction. Since a big part of the reason I chose to do Whole30 was to see how my body responded to different foods, this part was very important to me. I’m not quite done, but I can’t wait to see how I feel! SIMPLE variety. I ate a lot of the same foods. It’s only 30 days and it’s not the end of the world. I didn’t try too many new things because I was solely focused on getting it done. But if that’s too boring for you, there are tons of great recipes online or in the Whole30 cookbook. I mainly wanted to keep things simple so that I didn’t get swayed by a complicated new recipe. Maybe when I do it again, I’ll branch out more. Don’t neglect your family. I cooked for my kids and Ben as I normally would. Which is another reason I kept recipes simple. For example, I’d make compliant pasta sauce with ground turkey and for them, I’d make cheese tortellini and I’d eat zoodles or spaghetti squash. Another meal that worked great was tacos. They’d eat tortillas and chips, I’d have a taco salad or a burrito bowl with cauliflower rice. I also kept microwavable frozen rice packages so if I made a chicken dish for example, I’d heat up rice for Ben and I’d have an extra serving of vegetables or a small salad. Have someone you can vent to. This is important. Sometimes you need someone to give you a little moral support. Make sure you have a friend or two to text when you’re having a hard time (if they’ve done Whole30 before, that’s a huge bonus). When I was staring down a leftover piece of birthday cake, one of my friends said, “Don’t give in just for a piece of cake.” It was exactly what I needed to hear and chatting about it was enough to get it out of my system (thanks, Alison!). My toaster oven is one of my Whole30 Essentials. I ate a loooooooot of roasted vegetables over these 30 days and my toaster oven was not only great for making small batches quick, but it was also great for reheating roasted vegetables. Reheating roasted vegetables in the microwaves, is sorta…umm…gross. Well, it’s not the worst thing in the world, but it only takes about 5 minutes in the toaster oven to make them crispy again. Avocado tools, because you’ll eat a lot of avocados. I personally didn’t use the tool but if you’re not experienced with cutting avocados, this will make a world of difference. The Whole30 Book – my friend let me borrow hers and it was super helpful. It not only contains great recipes but it also has a lot of information that will help you be successful with this program. If you want more of the “why” behind the program, you might also want to check out this book. Parchment paper sheets. You’ll find yourself doing more dishes than normal on this program. I love lining my baking sheets with parchment paper when I roast vegetables for easy clean up. Cutting boards – you’ll want more than one, because you’ll be doing a lot of chopping. A good vegetable brush – this one is my favorite. I did a lot of scrubbing, especially all the sweet potatoes! An Instant Pot. Obviously this (along with the toaster oven) is a bigger investment, but it makes the best boiled eggs, and it cooks up chicken in a flash. I made a lot of salsa chicken for salads and cauliflower rice bowls. Both are kitchen appliances I use all the time, not just during Whole30. A whole bunch of RXBARs. I ate about one a day. Technically you’re not supposed to snack when you’re doing the Whole30, but since I work out 6-7 days a week and couldn’t drink my normal protein shake, I needed an extra “meal,” and these bars were perfect for that. There are also chocolate ones that satisfied that chocolate craving when it snuck up on me. Collagen Peptides – I stir these into my coffee each morning for an extra boost of protein (I do this when I’m not on Whole30, too). Plus, they’re great for hair, nails, skin and joints. I typically buy the large container of it but I also have the sticks in case I want to throw it in my purse when I’m on the go. Butternut Squash Zig-Zags: I love them roasted with olive oil (or coconut oil), salt, cinnamon, and a touch of cayenne. Pre-chopped Vegetables: Anything to make this easier, am I right? Beets: I’m on #TeamBeets, and Trader Joe’s has roasted beets ready to go! Frozen Burgers: I most often ate turkey burgers (I season them with Mrs. Dash), but the Chile Lime Chicken Burgers and the Grass Fed Angus Beef Burgers are also compliant. Frozen Green Beans: Even when I’m not on Whole30, I love TJ’s frozen green beans. They’re the best frozen green bean I’ve ever had. Riced Cauliflower – I also like Green Giant; I probably buy Green Giant more than any other brand but either will work, as long as it’s pure cauliflower with nothing else added. Guacamole – I tried to use fresh avocado as much as possible but TJ’s guac was perfect for when I was in a rush or when I cut into a subpar avocado. Salsa Verde – I love their salsa verde, on and off Whole30. I also found that one variety of their pickles is complaint, and their mayo also has no added sugar. Coconut Aminos – a great substitute for soy sauce. Chicken broth/stock – TJ’s is one of the only kinds I found without sugar or honey. There are lots more great products, but the ones listed above were my go-tos. This list seems pretty comprehensive if you need more ideas. Tessamae’s salad dressing – read the labels, because not all varieties are Whole30 compliant, but the Balsamic Vinaigrette was my favorite. Bacon. Bacon helped me survive. I only made it a couple times but it gave that variety I needed. Not many brands of bacon are Whole30 compliant, but I bought from US Wellness Meats and I was super happy with it – Ben and I both thought it was fantastic bacon. Salsa – hard to find without sugar! I liked Amy’s, and I’ll be continuing to buy it when I don’t make my homemade restaurant style salsa. Well, I know what you all want to know, and I lost about 11 pounds. Worth noting: I ate more than I typically would the weekend before I started (had to clear the house of all non-compliant foods, ya know?) so I was up 1-2 pounds due to some bloating and water weight. I also noticed healthier looking skin (my friends actually pointed this out) and maybe a slight increase in energy. One of the main reasons I wanted to do this program is because I wanted to regain control over what I eat and in general, I want to be a more mindful eater. There needs to be a healthy balance between eating to fuel your body and eating for pleasure. I also enjoyed cooking more! Yes, it was a lot of the same foods (in my case), but I did a whole lot more chopping of vegetables and slowing down to create something good to eat, rather than just throwing a bagged salad in a bowl and rushing through it at lunch. I’m reintroducing foods now and I’m excited to see how my body responds. Overall it was a great experience and I might just be crazy enough to do it again! Have any of you done the Whole30? Do you agree with my Whole30 Essentials? I’d love to hear what you couldn’t live without! Next question, would any of you want to do it as a group? In January? Email me if you’re interested! I’m thinking a Facebook group for support and also some simple meal plans? 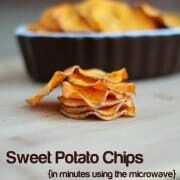 I love your interest in sharing real life recipes that are quick yet healthy. 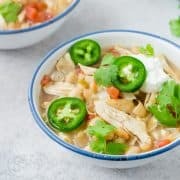 As part of your need to always have chicken available, I love the shredded chicken with salsa verde. My question has to do with vegetables especially for mealprep. How do you keep a ready stock of these I. The fridge and how do you preserve them (so they can be kept for a few days in the fridge) . Thanks again for sharing! I just keep them in airtight containers. Potatoes and sweet potatoes, I keep submerged in water. Greens I store in zip-top bags with a damp paper towel. I hope that helps! i did whole 30 about 3 years ago…and while i did eat better but i missed my social life and didnt like having to think about food being compliant etc. Yes! There is definitely more planning involved and social stuff is tougher. i love doing whole30. I’ve done it 4x. Trying to figure out when to do another round, but like you said, don’t do with birthdays and travel in the mix. I’m so impressed that you’ve done it four times. That’s amazing!!! Congrats on finishing!!! Thanks for being my Whole30 buddy :) Also please pity me when I’m still doing Whole30 on my birthday hahaha. I will send ALL the pity your way. Still can’t believe you’re doing it on your bday! You’re a stronger woman than I am.